Research shows that the foods we eat can directly improve or deteriorate heart function. Literally and figuratively, you can keep your hearts pumping well today by eating a balanced diet full of the right nutrients. A healthy heart goes hand in hand with a healthy diet, and when it comes to heart health one nutrient that really stands out is fiber. Studies show that fiber is excellent at preventing and reducing elevated cholesterol levels, which is a strong predictor of heart disease. Fiber, the indigestible part of carbohydrates, helps lower cholesterol by attaching itself to dietary cholesterol and sweeping it out of the body, so it never gets absorbed into the blood (where it would otherwise stick and build up on the artery wall). Pears are a delicious, convenient way to boost your fiber intake for the day. 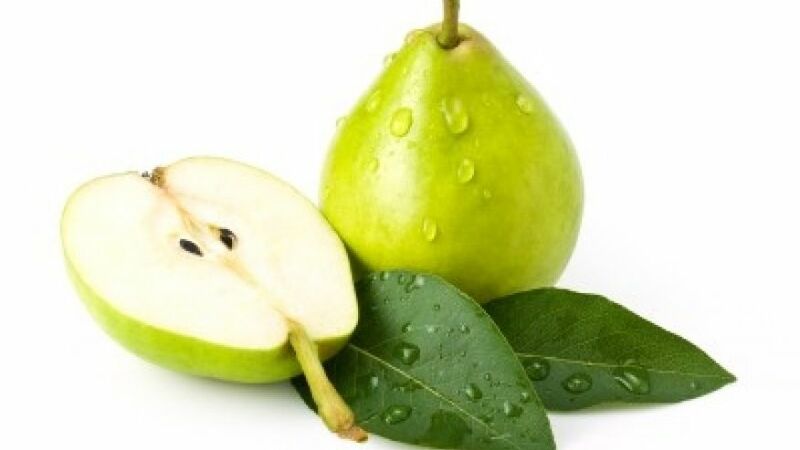 A medium pear puts you 6 grams closer to meeting your daily fiber needs—which for women is 25 grams, men 38. Although a high-fiber cereal doesn’t exactly scream romance, including it in your diet can be a great way to keep your heart at tiptop shape. Fiber can help to lower cholesterol in more ways than one. Bile salts (a crucial component in the proper digestion of food) are made from cholesterol. Fiber helps to lower cholesterol by reducing bile salts. When there is a lack of bile salts, cholesterol needs to be used from the blood to make new bile. Which means less cholesterol is circulating in the blood. A great way to boost your fiber intake is by having a serving of high-fiber cereal like bran buds or twigs first thing in the morning. A high-fiber cereal is one that contains at least five grams of fiber per serving, but the best ones can contain up to 14 grams in just one 60-calorie serving, talk about setting the tone for a fiber-FULL day. High blood pressure or hypertension is known as the “silent killer” because it carries no physical symptoms until damage has already been done to the heart. Foods high in potassium can help lower blood pressure because it antagonizes sodium and causes a loss of sodium through urine. Eating high potassium fruits and vegetables is one of the key elements of the very successful and effective DASH (Dietary Approaches to Stop Hypertension) diet. This is where bananas come in. One banana provides you with about 422 mg of potassium, which is around 13% of your daily needs. Make it V-day appropriate by cutting into slices and using a heart shaped cookie cutter to make banana hearts which can then be added to fruit salads, parfaits, or whole wheat toast topped with almond butter and banana hearts. Stay on trend and on track (with your diet) by loading up on kale this month. Not only do leafy greens contain heart healthy fiber and potassium, but antioxidants too, which have also been found to protect the heart. Free radicals cause oxidative stress to all organs, but can be especially taxing on the heart. To correct the oxidative damage caused by free radicals, try to include more antioxidants in your diet. Inflammation in the body can lead to heart disease. One powerful way to fight inflammation is with omega3-fats. Omega 3 fatty acids, typically found in fatty fish, chia and flax seeds, have been shown to decrease blood pressure and cholesterol by fighting some of this unhealthy inflammation. To get your omega-3 fix, try serving up some pink-heart-colored salmon for your love this V-Day. A three-ounce serving of salmon provides you with over a gram of omega-3 fatty acids!